When you think about a balanced offense, the first team that comes to mind is probably the San Antonio Spurs. Popovich’s beautiful passing offense truly feels like every player touches the rock and gets offensive opportunities. This well balanced sharing based offense has been not only well respected by many peer coaches, but has also produced one of the most consistently successful franchises in NBA history. With a resumé like that it should be easy to argue that the aim of every basketball team should be to have a balanced offense. But it’s also hard to deny the fact that having a superstar on the floor can also have some pretty profound effects on a team’s success. Curiosity began getting the better of me, and I started thinking about how I could go about testing such a claim. One thought was to utilize the simple statistical measure of standard deviation. Standard deviation measures how much your data varies with respect to the mean. In principle, a balanced team like San Antonio should display data that has a lower standard deviation, whereas a superstar-centered team like Oklahoma City should display data that has a much higher standard deviation, where the data is more spread apart from the mean. That’s what we like to call a high standard deviation type of offense. But—as some of you keen readers might have wondered in this short paragraph—which data should I use? The next piece of the puzzle, was figuring out what stat I should use to illustrate offensive distribution and eventually apply a standard deviation analysis. The first stat that came to mind was Field Goal Attempts (FGA). Seeing how many players got a chance to shoot should give a sense of how the offense is being distributed. For example, if a team has 10 players with roughly the same number of FGA, you should have a lower standard deviation vs. a team that has a few players disproportionately shooting a ton. However, this isn’t exactly the best representation of offensive sharing. Players can still be included in the offense even if they do not take too many shots, so that led me to using Usage percentage (USG) as my stat of choice. “USG is an estimate of the percentage of team plays used by a player while he was on the floor” and within its calculation it considers not only FGA, but free throw attempts, turnovers, and team minutes. The downside of this statistic is that if James Harden holds the ball for 22 seconds before passing to Trevor Ariza to shoot, it counts as though Ariza “used” the possession despite Ariza barely having the ball for a second. However, with a large enough data set, we should be able to ignore these one-off instances. Hmm…So there definitely seems to be better teams the higher the standard deviations get. Let’s take a look using R 1. Well that’s definitely something. So it looks like there is a decent negative correlation between season ranking and the average standard deviation of USG. In other words, the worse your team ranks, the more balanced your offensive distribution tends to be. Now of course this is only a correlation, and it doesn’t necessarily give us definitive proof of anything, but let’s think a little bit about the top five ranked teams displayed here. 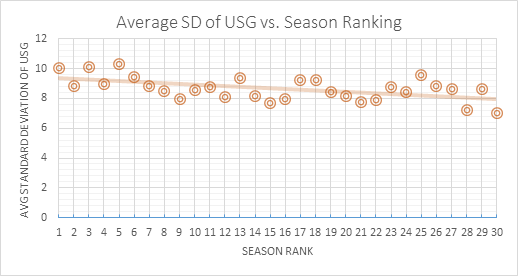 Among the higher tier of the NBA the negative correlation between season rank and Average SD of USG is even greater. Now this shouldn’t have us jumping to any crazy conclusions like “damn we need to trade all of our players for a superstar ” 3, but I think it does highlight how important those stars are to teams with the right environment. For example, while Cleveland and Golden State illustrate a higher standard deviation, they are by no means stagnant offenses; however, they probably do benefit from concentrating their offense on their star pieces as opposed to letting everyone else get an equal share. So at the end of the day, maybe teams do need a little Kobe in their lives. Kobe knew balanced offenses were overrated all along.